Germfree manufactures advanced rental trailers to deliver rapid and flexible solutions for a range of applications. These self-contained units provide cleanroom process areas, laboratory/R&D space and any biocontainment requirements. Germfree’s rental trailers bring advanced capabilities when existing infrastructure is insufficient or unavailable. We configure our mobile units for the demands of your current operations. However, core air filtration or biosafety equipment is interchangeable to adapt to any new process or laboratory requirements. Additionally, our turnkey facilities may be leased for the duration of your project. 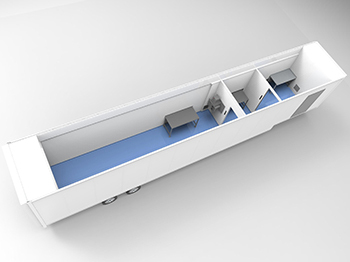 We have extensive global experience in manufacturing transportable cleanrooms and labs. Our biocontainment and cGMP expertise has positioned us to develop advanced mobile facilities with complex controlled environments. Many applications require small-scale, flexible process areas and cleanrooms. Separate, short-term space is often ideally suited for the early stages of production or development. For startups, these units can be repurposed for new R&D operations or to ramp up production in later phases. We integrate all primary and secondary containment systems for applications that involve handling potent materials or hazardous biological agents. Germfree’s rental trailers can also be placed to separate pathogenic agents from other buildings. Germfree’s rental trailers offer an advanced and rapid approach to handling space constraints and surge capacity, or adding new levels of aseptic conditions and containment. They can be installed for ongoing operations or easily repurposed for process change-outs. Transportability allows for strategic positioning or relocation to wherever they are needed. Leasing can mitigate risks and curb expenditures for projects that have variable durations. Additionally, during building renovations these units provide critical capabilities allowing for uninterrupted operations. As self-sustaining facilities they minimize on-site disruptions. It is imperative for laboratories and cGMP production areas to have properly integrated engineering controls. All HVAC, air filtration and containment systems must be precisely configured for the facility. 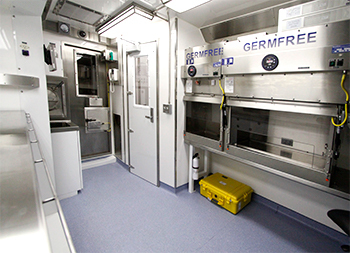 Germfree has extensive experience in manufacturing mobile cleanrooms and laboratories that meet these critical demands. Germfree also manufactures and integrates all core equipment installed in our rental trailers including: Custom RABS and Pharmaceutical Isolators, Class III Biological Safety Cabinets, Class II BCSs, Laminar Flow Workstations, Powder Containment Enclosures and Fume Hoods. All Germfree products are manufactured in our environmentally controlled factory. Our leading-edge fabrication technology, engineering teams and subject-matter experts are located at our 173,000 square foot (16,000 square meter) US plant. Having a single source solution accelerates your project timeline. 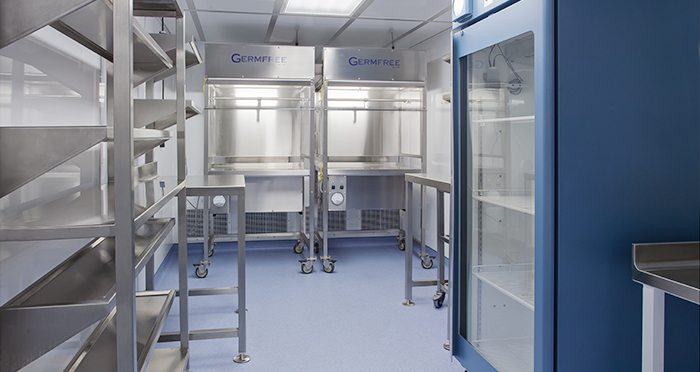 Germfree’s rental trailers offer the most flexible approach to adding cGMP-compliant space and containment. As a single-source OEM for both the facility and all core equipment, we deliver advanced solutions wherever they are needed. Germfree’s approach brings innovative capabilities to boost overall performance and accelerate Time-to-Market. Contact Germfree to discuss your requirements and our leasing options. In addition, for compounding in clinical drug trials, we maintain a fleet of USP 797/USP 800 rental trailers.